The Japanese Premium collector’s edition for Resident Evil 2 (known as Biohazard RE: 2 in Japan) comes packed with immersive memorabilia. The most notable item is the typewriter and ribbon inspired by the in-game items required to save. 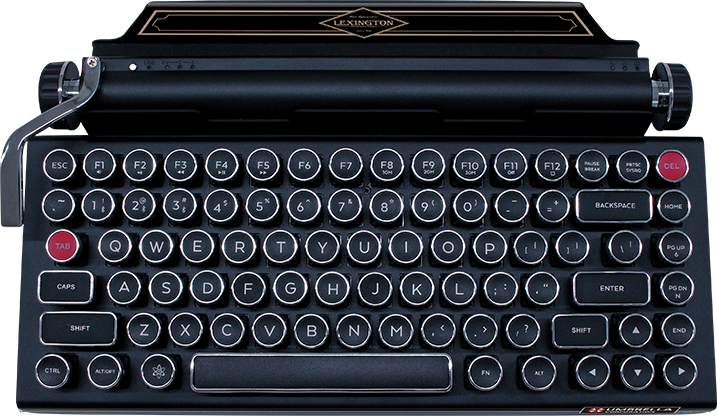 The Lexington Vintage Typewriter Bluetooth Keyboard, made in collaboration with Qwerkytoys Inc. in the US, can be purchased separately for 75,000 yen ($675) plus tax. It’s compatible with smartphones, tablets, and PCs. The Limited Edition comes with the typewriter, Resident Evil 2, and a single ink ribbon for 82,800 yen (~$746). The standard collector’s edition comes with all the extras pictured above, but no typewriter and only one ink ribbon for 24,800 yen (~$225). Lastly, fans can purchase the game and one ink ribbon for 7,800 yen (~$70). Who doesn’t love a good collector’s edition? Japan really went all out on this one. Are you looking forward to the changes Resident Evil 2 is making to the original story and mechanics? And will you be picking up the game up when it releases on January 25, 2019 for the PlayStation 4, Xbox One, and PC? Let us know in the comments.